Both north and south of I-70 in eastern Utah are dozens of rugged, unpaved roads for exploring the backcountry throughout the San Rafael Swell. Boulder Mountain, south of SR 24, has many roads that are excellent for 4-wheel drive vehicles. North of Boulder Mountain over the back of Thousand Lake Mountain via Loa and Fremont is a ruggedly scenic 25-mile ride to Cathedral Valley in Capitol Reef National Park. One of the most popular drives in southern Utah (accessible to passenger cars when dry) is the Burr Trail. From Boulder, it extends for 66 miles through BLM's Long Canyon and Circle Cliffs, the Waterpocket Fold of Capitol Reef National Park, and other amazing scenery to Hwy 276 above Bullfrog Marina on Lake Powell. In southwestern Utah, the East Fork Trail System in the Dixie National Forest begins at Tropic Reservoir; drivers are cautioned that some roads on the system are still closed for logging operations. Other favorite areas for off highway vehicles include Kodachrome Basin State Park (south of Cannonville), BLM's Sand Mountain (8 miles southwest of Hurricane), and Coral Pink Sand Dunes State Park, which contains 3,000 acres of brightly colored sand dunes available for OHV use. A 60-mile drive from Escalante, southeast on BLM land to the famous Hole-In-The Rock overlooking Lake Powell, affords unusual scenery along the Kaiparowits Plateau. 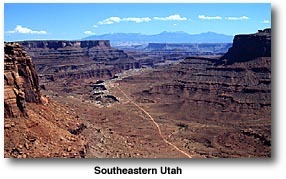 Southeastern Utah has been called the off-highway vehicle capital of the world. The famed Moab Jeep Safari, held every Easter, attracts many 4-wheeling enthusiasts who come to explore the area's driving challenges, such as the Moab Rim, Poison Spider Mesa and other BLM routes. Participation in this popular event is allocated by an advance registration lottery system. One of the most talked about 4-wheel drive roads in southern Utah is Elephant Hill in the Needles District of Canyonlands National Park. Also in the park, the White Rim Trail loops around the Island in the Sky mesa for over 100 miles. Reservations for this adventure are recommended. West of Blanding, a 38-mile dirt and gravel road travels over Bear's Ears in the Abajo Mountains to Natural Bridges National Monument, and connects to forest roads that drop into Beef Basin or continue on to Monticello.